Download this free printable scary Halloween invitation. 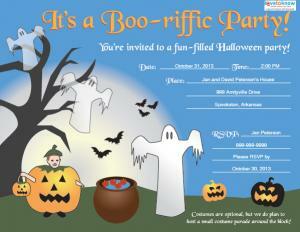 Use printable Halloween party invitations to keep your costs low and get guests to your spook-tacular celebration. Printable invitations are usually much cheaper than ones purchased from a graphics design studio or even from party supply stores. You can also customize your wording and print more as needed without having to reorder. Download printable invitations that fit your party theme. Not all parties are the same, so make sure your invite suits your party atmosphere. If you need help downloading the invitations, check out these helpful tips. A costume party is a classic Halloween party theme. Make sure your invites convey the costume part by picking ones with festive characters on them. Download and print a Halloween costume party invitation here. Scary parties are perfect for teens and adults who want to have a frightful night. Download and print a scary Halloween invitation here. Party invitations for kids should be cute, not scary. Make sure your invite follows that theme. Download and print a cute kids' Halloween invitation here. Of course, Halloween isn't just for the kids. Plan an adults-only party with some creepy cocktails! Download and print several adult Halloween party invitations here. If you're just having a fun get-together for friends, family and neighbors, you don't necessarily have to plan a theme beyond the basics. Download and print a general Halloween party invitation here. Simply fill in your pertinent party information and either mail or hand out the invitations a week or two before your party. Download several adult Halloween party invitations here. Download this kid's Halloween party invitation. 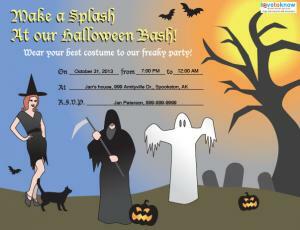 Download this general Halloween party invitation. Seek out invitations through a variety of websites if you don't find the exact one you're looking for at the first place you visit. Doing it yourself (DIY) is another option for crafty party hosts. Hoover Web Designs: Simple half-fold and quarter-fold Halloween invitations with plenty of different styles are available as PDFs at Hoover. 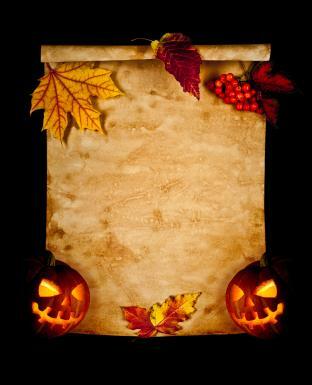 Internet Family Fun: Print off one of several fill-in-the-blank Halloween party invitations. Mint Printables: Matching envelope printables are available for the six different Halloween party invitations. 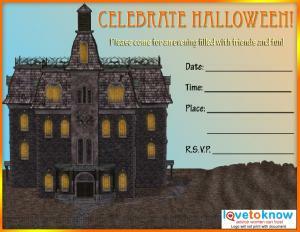 Activity Village: Print festive Halloween party invitations perfect for kids. To achieve the best results, print the invitations on heavy, high-quality paper. Print in black and white to save ink and have kids color in the pictures to save even more money or for a customized touch. Many Halloween invitations use lots of black and orange ink, so make sure you have plenty of those cartridges available. ShareHolidays lets you download your favorite Halloween invitations with one low subscription price. The various invitations range from spooky and scary party ones to family-friendly cute ones. Pick from hundreds of designs from various sellers on etsy who have affordable and unique Halloween invitations for downloading. If you want to jazz up your own design,download these creepy fonts listed at Word Tips. Print invitations on parchment paper. The most creative way to create a printable Halloween party invitation is to make it yourself, using your current computer programs and graphics. Most word processing programs have card-making templates and a few simple graphics for you to create party invitations. Personalize the invitation by using a photograph of your carved Halloween pumpkins or a picture of your kids from last year's Halloween party. Crop it to fit the front and add the invitation wording around the picture. Otherwise, consider using a faded version of the photograph as background, with boldface font on top of it. At a mixed age-group party, consider printing off two different invitation designs. One design could be scarier or more sophisticated for the teen and adult Halloween party invitations, making the second design cute for any kids who are attending. Children enjoy getting their own invitations, and the money saved on professional printing can be used for the small amount of additional postage their separate invites will cost. 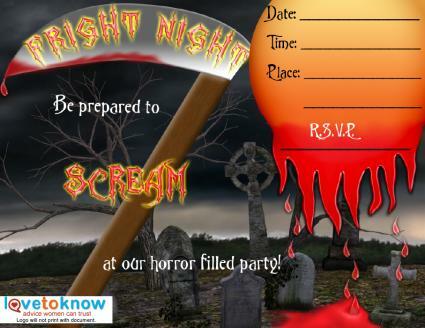 Scary Halloween parties: Gory invitations would be perfect for an adult party. Look for ones with lots of body parts and disturbing monsters. Haunted houses and graveyards are also creepy images for a scary Halloween party. Kid-friendly Halloween parties: You don't want to terrify youngsters who are attending a party. Smiling ghosts, happy pumpkins and friendly witches are a few good choices. Bright colors, like yellow, orange and purple can help offset the dark black imagery of the holiday. Costume parties: Make sure you pick out invitations featuring costumed characters. While you may think the costume image is enough, make sure everyone gets the costume hint by adding a line to your invitation about dressing the part. A party invitation isn't that hard to make or create on your own. Consider your decorations, theme and budget when you decide what invitation to choose. No matter which one you print, invitations are the first step to planning the perfect Halloween party!